The Mewlon Series of Dall-Kirkham Telescopes by Takahashi© combines refractor-like performance in a larger folded optic reflector design. The EM-500 Takahashi mount provides a stable, accurate platform for the M-300. The integral polar alignment telescope and R.A. axis level make accurate polar alignment to within 2 arc minutes of the celestial pole quick and easy. The reticle is designed to be used in either Hemisphere until the year 2030. No other manufacturer uses such a highly accurate polar telescope. You have dreamed of a reflector with exceptional and powerful optics, with a generous diameter and with the guarantee of an incredible contrast : Mewlon is for you ! 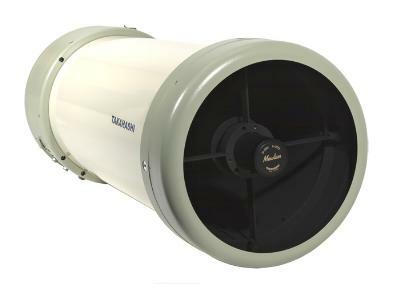 Mewlon are Cassegrain reflectors using the Dall-Kirkham optical design. The elliptic primary mirror is associated with a spherical secondary mirror. The image is returned to the back of the instrument via an opening spared in the center of the primary mirror. The precision of optical surfaces is at least of ?/20. This standard of quality induces a strong concentration of the light in Airy disc, physical image of a star looked through any optical system. The stellar images are more defined and contrasted. The Mewlon primary mirror, oversized compared to the effective aperture, is installed in a mirror cell especially designed to avoid stresses sometimes generating of astigmatism. Click the button below to add the Takahashi Mewlon-300 Complete System w/EM-500 Temma-2M GOTO Mount to your wish list.